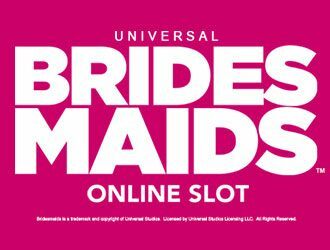 Brides maids is a slot designed by Microgaming whose theme is based on a superhit film that was released back in 2011. That romantic comedy movie has some funny clips which are included in the game as well. The reels are perfectly diamante-framed with beautiful pretty pink sparkling paylines. Brides maids feature 5 reels along with 40 paylines while the stakes vary from 40p up to £60 for every payline. All the six characters are featured in the movie are also included in the slot. The scatter symbol is the cupcake and if you land at least three of them on the reels, the Wheel Bonus Feature will get triggered. Then, a chance will be given for spinning the Bonus Wheel which can give prizes from one to fifteen. Up to ten cash prizes are present along with four bonus features & one jackpot prize. A Cupcake Booster Round is present in which a cupcake needs to be picked up which will fetch you four different prizes. It may be a 3x or 2x multiplier on all the pink coloured cash prizes, a 3x or 2x multiplier on all the blue coloured cash prizes, a 3x or 2x multiplier on all the wheel cash prizes and two extra wheel pointers too. When it comes to cash prizes, you can win as much as 300x the bet amount. There are 4 bonus rounds in which one is Flying High Free Spins that will fetch you free spins up to 10. Other rounds include Growling Wilds and Rolling Reels – Growing Wilds will increase one wild on each spin making the total of wilds up to 13. Some consecutive wins can be grabbed by Rolling Reels feature since some of the winning symbols will be substituted by new symbols. A win worth 1,200x the amount at stake is also present. Another bonus round is Friendship Free Spins in which free spins up to 10 will be granted. Moreover, the winning combos will pay in both directions: right – left and left – right. Annie will be stacked on reels one and two, Helen will get stacked on reels four and five whereas Lillian symbol will get stacked on reel three. The free spins can be retriggered making up their total to 20. In Boutique Bonus round, Brides maids need to be matched which will fetch you some cash prizes. Two bridesmaids are present with attached multipliers and if the multipliers match, an additional multiplier will get added to total win. Last bonus is Magic Moments Bonus round in which magic moments will be required to pick up that in turn will reveal prizes. 10 moments will be present in total out of which 9 will fetch you a cash prize and you will have to pick up again. One of them will terminate the feature. Don’t miss out this feature since it has the ability to grant wins up to 350x the amount at stake. Going by the name, the slot may look and sound girly to many people but your main aim is to avail the benefit of many bonus rounds on offer. The slot has a medium variance and has loads of action packed in it. Thus, Brides maids are certainly worth checking out.